CAMBRIDGE — It’s a sensory paradox. Music is an aural art, yet the richer its sounds the more they can conjure up images. This relationship between seeing and hearing is central to “Art of Jazz: Form/Performance/Notes” at Harvard’s Ethelbert Cooper Gallery of African & African American Art. The show runs through May 8. The relationship is dauntingly rich, so much so that the 90 items in “Art of Jazz” feel far more preliminary than comprehensive. 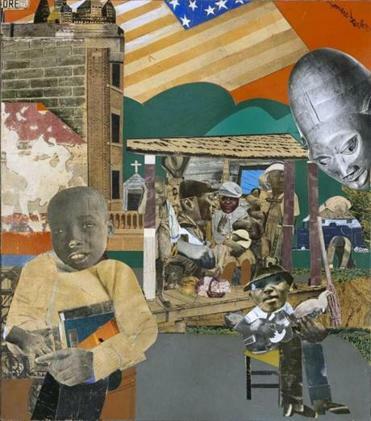 That may be why the show’s emblematic work is Romare Bearden’s 1969 collage “Soul History.” It’s a jumble — black-and-white as well as color, angles and curves, multiple planes, multiple faces, American flag and African mask — but it’s a coherent jumble. Bearden wants to evoke, and he does, rather than summarize. How to summarize something that’s taken so long to evolve — and whose evolution continues? Evoking may be another way of saying Bearden wants us to listen with our eyes and see with our ears. The Bearden is one of 18 works that are physically off-site, in a gallery at the Harvard Art Museums, on 32 Quincy St. It’s about a 10-minute walk from the Cooper Gallery, where reproductions of those works are shown in rotation on a lightbox. The walk is worth it, since the works include a Matisse cut-out, “The Sword Swallower,” from his “Jazz” suite, and Viktor Schreckengost’s ebulliently Deco “Jazz Punch Bowl.” This is one vessel you definitely want to drink whatever it contains. If “Art of Jazz” errs more on the side of jumble, that’s unavoidable. Any music that can encompass, say, Ahmad Jamal and Cecil Taylor — almost exact contemporaries and as different as block chords and free jazz — defies anything like summary description. “Art of Jazz” takes a number of approaches. It starts with album covers — an obvious marriage of musical and visual. In the ’50s especially, there was a vogue for modern artists doing cover art. Some were commissions. Josef Albers’s designs for several volumes of “Persuasive Percussion” and “Provocative Percussion” work surprisingly well. Andy Warhol, still a commercial artist in 1955, for a Count Basie LP? Not so much. Other times it was a case of like meeting like. Jackson Pollock’s 1954 painting “White Light” on the cover of Ornette Coleman’s 1961 album, “Free Jazz,” acts both as design element and declaration of aesthetic ambition. There are books, posters, and photographs. 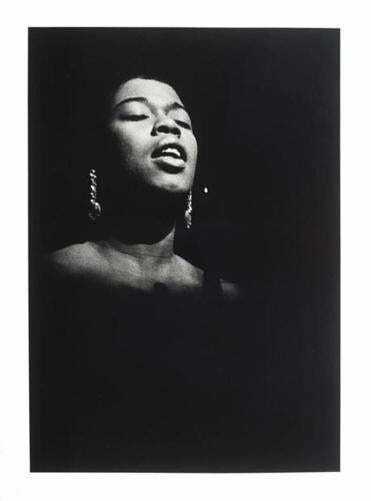 The latter mostly offer portraits of musicians — Hugh Bell’s gorgeous presentation of a gorgeous Sarah Vaughan stands out — though Carl Van Vechten portraits of a young Bearden and the great tap dancer Bill “Bojangles” Robinson are also on display. The heart of the show comprises attempts in various media to summon a jazz feeling — jazz being construed loosely, and properly so. The ones that succeed do so memorably. Ming Smith’s “Invisible Man With Borders” is an homage to Ralph Ellison’s classic novel, a work in which jazz figures as a silent ground bass. Whitfield Lovell’s assemblage “After an Afternoon” consists of three dozen vintage radios. Although it has nothing to do with jazz per se, it harkens to a time when jazz filled the airwaves. The radios are wonderful to behold, objects varied in shape and texture, a landscape of knob, dial, and cord. “Art of Jazz” concludes with art from a jazz musician, art twice over. The pianist Jason Moran’s “STAGED: Three Deuces” is an installation that pays tribute to the famous jazz club. Beneath a lovely pressed-tin ceiling stand a covered upright bass, a battered drum kit, and a player piano playing a Moran composition. The music has a pensive gravity, as does so much of the exhibition. It’s a shame that sound leakage from other rooms interferes with listening to the Moran piece. One could argue that that’s fitting. What jazz musician hasn’t had to compete on the bandstand with the sound of glasses clinking, people talking, and cash registers doing their cash register thing. Or maybe that’s taking authenticity too far?